Adipose tissue is also known more commonly as body fat. Allogeneic transplants are performed with donor stem cells, these cells may come from someone the patient knows such as a family member or they may come from a donor on a register. Autologous transplants are performed with the patient’s own stem cells, they are harvested before treatment. A sponge like substance found in the centre of bones. Bone marrow is rich in stem cells and is responsible for the manufacture of the body’s blood cells. Cancer is a disease which can cause tumours and malignant growth. Cancer is caused as a result of cells dividing in an abnormal and unrestrained manner in a particular area of the body. Cerebral Palsy is caused by a lack of oxygen to the brain. Characteristics of cerebral palsy include involuntary tremors and paralysis. The blood which is found in the placenta and umbilical cord after birth. 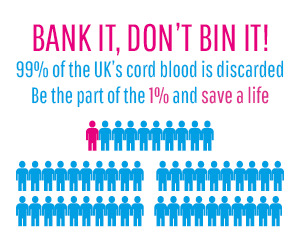 Cryopreservation is the method use to effectively preserve cord blood for long periods of time. Cancer of the blood. This kind of cancer can be characterised by leukocytes reproducing abnormally. Mitosis is a process of cell division, when cells divide in this way they produce two identical cells. MSCs are mesenchymal stem cells. These stem cells have the ability to differentiate into a variety of cells which can form bone cells, cartilage cells, connective tissue cells, fat cells, muscle cells, nerve cells, tendon cells and ligament cells. The placenta is a circular organ which nourishes the foetus through the umbilical cord during pregnancy. Plasma is the main component of blood and transports blood cells around the body. Yellow in colour, plasma contains proteins and other substances. Plasma can be used in the treatment of many conditions. Pluripotent cells have the ability to create all the tissues of an adult, pluripotent cells are stem cells. Regenerative medicine is a new and exciting area of medicine using the body’s own cells to repair, regenerate or replace damaged tissues. Sickle Cell Anaemia is a hereditary condition of the blood in which blood cells form in an abnormal crescent or sickle shape. Stem cells can produce an indefinite amount of cells of its own type but also produce more specialised cells. Stem cells are described as being undifferentiated. 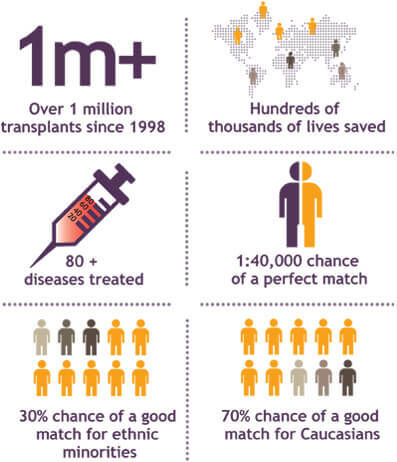 Syngenic transplants are the rarest kind of stem cell transplant. In order for a syngenic transplant to take place the donor and patient must be genetically identical, an identical twin. The umbilical cord attaches the baby to the placenta which in turn attaches to the mother. The umbilical cord allows the baby to receive nourishment from its mother and allows the baby to send waste to the mother to dispose of. Undifferentiated cells are unspecialised cells and can produce a variety of cells with a specialised role, these cells are stem cells. A method of processing cord blood to reduce the volume of the sample for storage, this method discards many valuable cells within the sample. Very Small Embryonic Like stem cells, they cells are found in cord blood and have retained pluripotent characteristics. Their name comes from their similarity to embryonic stem cells but these cells are NOT embryonic. A method of processing cord blood. This method retains as many cells as possible and provides a better sample for use in both regenerative and transplant medicine later on if needed.